Great Central Railway is a day of rail travel from yesteryear. You can explore the train sheds, the model railway and the waiting rooms. You could even catch the train from Quorn, where there is a large car park and visit the stations along the line. There are special events held regularly so it’s best to check the up to date details on the website. The app can be downloaded from your app store – you will need to create an account to use it – why not create a unit account then whenever you are out and about you can find caches anywhere, anytime! This game can be played outside or in a large area. Choose one child to be a caboose. The rest of the children create one or more trains (depending on numbers playing) by hooking together/holding the t-shirt of the person in front. The caboose tries to catch onto the back of one of the trains. Trains chug around and try to avoid being caught by the caboose. When the caboose catches a train, the engine (the person at the front of the line) of that train becomes the next caboose. NB A caboose is a manned North American railroad car coupled at the end of a freight train. Cabooses provide shelter for crew at the end of a train. Use different fruits (which fruits you use is entirely up to you and your unit). How many different fruits can you use in your train? (Don’t forget to share your photos on social media using our hashtag #GirlguidingLeicestershire! 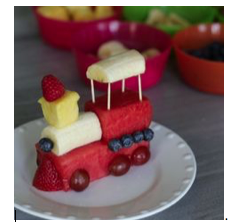 The train the picture below uses watermelon, banana, grapes, blue berries and pineapple.